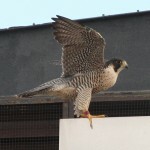 As mentioned in IMPRINTS, an adult peregrine was seen at one of the buildings in Kodak’s Eastman Business Park. Kodak Park is a huge complex and the falcon could be anywhere. One thing for sure, there is an abundance of pigeons. Late yesterday afternoon about 5:15 pm Brian H and I were heading to check the area where we heard the mystery falcon was spotted. 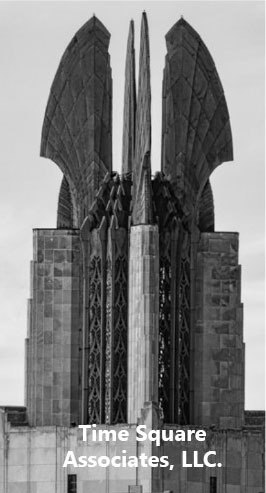 We were traveling west on Ridge Road when I spotted a large bird on one of the Kodak buildings to my left. It was slightly silhouetted, and I asked Brian if it was a red-tailed hawk. Brian thought it could be because of the size, and got out his binoculars to check. I saw the head moving up and down, likely eating. We were waiting for the red light to turn, and Brain says it’s a peregrine falcon. I immediately turned left onto a short entrance roadway to Kodak. I stopped a cars length from the gate, and Brian saw the purple band. It was on a building that was close to the entrance. It was a good size falcon and both of us were sure it was a female. We didn’t want to spook the falcon, but we finally got out of the car. I used the car as my tripod. The falcon had it’s right side to us, and all we could see was the purple band. I was hoping that I could get a shot of the black/red band when it took off, but no luck. This is an absolutely beautiful peregrine! After going through my photos, I thought I saw faint lettering on the black in one if the shots where the falcon had its head turned away. I even tried using a magnifying glass. 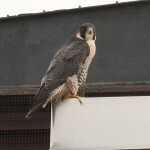 Unless this falcon stays on a building close to Ridge Road, it will probably take a scope to ID it. One thing for sure, this is a Midwest Peregrine. If you happen to see watcher’s tweets who are out looking for this falcon, we are using Brian’s acronym PPE (for the Purple Pigeon Eater). Here is my Picasa Album to our Midwest visitor.